In the past decades, Amazon has extended its reach into physical device realm and achieved blazing success. Two years after its tablet Kindle Fire HD was released, it finally steps into the final genre-smart phone race with the unveiling of the Fire Phone. In this industry which is crowded with numerous manufacturers and dominated by Samsung and Apple, it's hard to gain success without differentiation. Amazon, however, under this context, stands out with its first attempt in the smartphone market. As cool as the innovations that Amazon Fire Phone has are, it does not support DVD playback directly. Fortunately, various kinds of DVD rippers are available out here to help with this trouble. However, the most efficient way, both functionally and economically, using the reliable MacX DVD Ripper Pro. This DVD ripper can professionally rip DVD to Amazon Fire Phone, Kindle Fire, Kindle Fire HD and other mobile devices such as Samsung Galaxy Tab S, iPod, iPad Air, iPad Mini/4, iPad 4/3/2, Apple TV/3, Android and many more with 36x speed and superb quality. What's more, it is also capable to convert DVD to various video formats, like MP4, H.264, MOV, FLV, MPEG, M4V, AVI, WMV, MKV, etc. Notes: Another important feature of this DVD ripper for Mac that you may interested in lies in its ability to support the latest DVD copy protections like Sony ArccOS protection, DVD region codes, RCE, CSS and Disney X-project protection. This allows you to rip freely and smoothly any hottest DVDs, such as Inside Out, Star Wars 7 and other DVD movies you like. Download and install this ripper on Mac. Launch it and click "DVD Disc" to import the DVD you want to rip. You can directly choose "Amazon Fire Phone" from the list "to Amazon Mobile Video". Or you can just choose a specific Amazon Fire Phone supported video format, be it MPEG4, VP8, H.264/MPEG4/AVC, MPEG4 SP, H.263 by reference to the best video formats Kindle Fire support. Tips: you can also rip DVD to iPad, DVD to Android tablet, DVD to Surface Pro 3 etc from the respective device profile. Click the "Browse" button and choose the output folder where you would like to save the output video file. Finally, hit the bottom right "RUN" button to start new movie DVD releases to Amazon Fire Phone conversion on Mac. BTW, if you want to put the converted DVD content to iPhone iPad iPod, you can use MacX MediaTrans to transfer video from computer to iOS devices for free enjoyment. 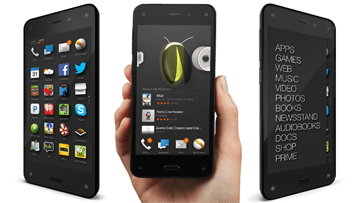 Amazon Fire Phone brings a slew of exciting features among which there are two highlights in particular: a feature called Firefly that can identify everything from email and web addresses, to 35 million songs, 24500 movies based on how something looks or sounds; and a technology Amazon calls Dynamic Perspective that adjusts what users can see as they tilt or move the phone. Firefly: Firefly is a feature which you can use to scan and identify any products and media by just pointing the camera at something. This allows the Fire Phone to do a number of useful things for you. For one, it does a good job picking up movies, TV shows and music with just a glare. Dynamic Perspective: Dynamic Perspective comes as a critical selling point for Amazon. It's a touchless gesture system combined with a kind of 3D-viewing effect. With Dynamic Perspective, the Fire Phone's interface changes based on how users look at it and how users orient to it. "I bought this brand-new Amazon Fire Phone days ago. I was so impressed by its amazing features, the Firefly, Dynamic Perspective, 3D-like visual effects and semantic visual search app...but I want to put new DVD movies to it and don't know how. Someone tells me that I should convert DVD to Amazon Fire Phone, is there any software that can help me out?" Tips: In addition, many other useful features like extracting audio from the video, cutting unwanted part, adjusting aspect ratio to Full Screen, 16:9, 4:3, 1:1, adding external subtitle etc are also available for you to better set your output files. Notice: We only advocate using this best DVD ripper to rip commercial DVDs to Amazon Fire phone under the concept of Fair Use and do not encourage any illegal reproduction or distribution of copyrighted content. Please abide by the local DVD copyright law before doing it. 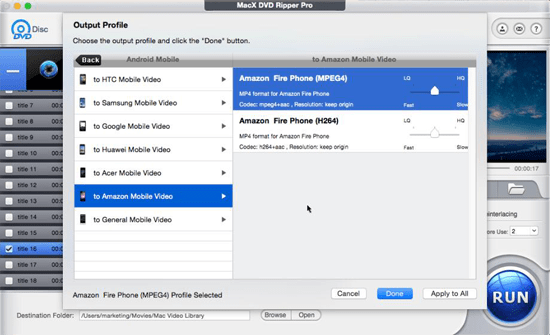 MacX DVD Ripper Pro is one of the best tools that you can find for ripping DVD content to your Amazon Fire. It's a handy thing to have when you're trying to back up your DVD collection.